Two of the victims were decapitated while two more died after they were pushed off the roof of the building. The authorities restarted negotiations with the rioters on Monday morning in the hope of ending the stand-off. 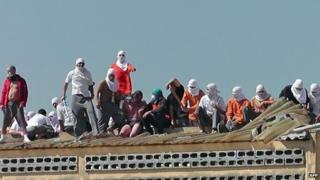 At least 700 prisoners are reported to be involved in the uprising, which began on Sunday morning. The prisoners are said to be unhappy about how the prison is run, as well as about food and hygiene there. Local media showed prisoners beating men held with ropes around their necks on the roof of one of the buildings. The trouble broke out when warders delivering coffee to inmates were reportedly overpowered. As many as 1,000 prisoners then took over parts of the jail, ransacking and setting fire to much of it. The BBC's Wyre Davies in Rio de Janeiro says that rival prison gangs are most likely taking advantage of the riot to settle scores. The leaders of the rebellion are holding at least two prison guards hostage. It is not clear whether the hostages have been harmed. Guards have not yet been able to retrieve the bodies of the four people killed in the unrest. "They are using the severed head of one of the prisoners to inflict psychological torture on one of the hostages," said Jairo Ferreira, lawyer for the prison agents' union. "There are scenes of terror inside the jail now," he told local newspaper Gazeta do Povo. Negotiations restarted first thing on Monday to put an end to the uprising, which has led to the destruction of most of the penitentiary, according to O Globo newspaper. The Security Secretary of Parana State, Maria Tereza Uille Gomes, has travelled to Cascavel to take over the negotiations. Brazil has the world's fourth largest prison population, with half a million inmates in facilities meant to hold 300,000. Our correspondent says that, across the country, many poorly resourced jails are in effect run by powerful crime gangs. Earlier this year the UN High Commissioner for Human Rights, Navi Pillay, called for an investigation into the high number of violent deaths in Brazil's prisons after previous riots at a jail in the north of the country left dozens of people dead.